TWIT installation of 300 of Trump’s tweets stamped on handmade orange/yellow paper. The installation and mixed media works by Deborah G. Nehmad, addresses two of the most disquieting issues confronting America today, the President’s verbal incontinence and gun violence. The installation surrounds the viewer with over 300 of Trump’s divisive tweets, issued both before and after he became President, stamped on handmade orange/yellow paper. Contradictory twits will lock beaks. Tweets criticizing the previous President are amazingly prescient descriptors of Trump’s actions and behavior in office. In the second 12 months following the massacre at Sandy Hook Elementary School, 137 children aged 10 and under either shot themselves or another child or were shot by an adult. The 12 visually compelling needlepoints comprising “what’s wrong with this country? – the next 12 months” break down these statistics on a monthly basis which can be read with a QR code reader downloaded to a smart phone. In “old glory?”, Nehmad hand stitches the number of average yearly deaths from gun violence in America from 2014 – 2016 as the stripes of an American flag – 7 stripes comprised of black x’s representing suicides, 6 stripes of red crosses representing homicides. The 51 “ stars” are presented as black and white targets burned with holes representing the number of deaths in mass murders over the past 25 years for each individual state and the District of Columbia. While stunning from a distance, the patterns of holes and stitches convey a powerful, poignant symbolism, functioning as catalogues of tragedy. This is Nehmad’s second solo exhibition at the Kim Foster Gallery. The individual tweets are arranged chronologically and grouped together in a form that resembles a migration pattern. Through it, a narrative emerges, painting a picture of the man behind the impetuous language. Adding to the visual metaphor are tweets that are positioned beak-to-beak for when the messages contradict each other..
Deborah Gottheil Nehmad is a Honolulu-based artist whose works on paper have been seen in museum, non-profit and gallery venues since 1998. She was born and raised on Long Island in New York and graduated from Smith College with her B.A. in 1974. In 1982, she received her JD from Georgetown University. After years as a practicing attorney and working in politics (including the Carter White House), her legal work brought her to Hawaii in 1984. In 1985, an accident precipitated a series of life altering events. 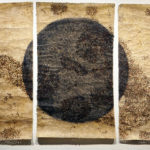 By 1998, she had earned her MFA in printmaking from the University of Hawaii – Manoa. Initially derived from personal pain, my artwork has evolved into an obsession with mark making and working the surface of the paper into a visual meditation. To me, paper is like skin, and by extension, the body itself. Both the processes I employ – I repetitively burn, etch, scrape, score, stamp, puncture, incise, type, apply pressure, write and draw – and materials I incorporate – heat, paper, gut, glass, ink, thread, soot and metal – offer a visual vocabulary that seems to parallel the way in which pain marks a body. My most recent work addresses anguish on a broader scale, incorporating obsessive mark making to translate visually what cannot be conveyed adequately through the abstraction of written language. She has participated in numerous solo show and group exhibitions in Hawaii, on the “mainland”, and internationally. Her work can be found in many public and private collections including the New York Museum of Modern Art, the Fine Art Museums of San Francisco, Yale University Art Gallery, the Davis Museum and Cultural Center at Wellesley College, Smith College Museum of Art, Hood Museum at Dartmouth College, the Hammer Museum of UCLA, the Honolulu Museum of Art, the Hawaii State Art Museum, and the Contemporary Museum in Honolulu. She has received numerous awards, including purchases from funds provided by the Wallace Alexander Gerbode Foundation and was one of six Hawaii artists included in the Sixth Biennial of Hawaii Artists at The Contemporary Museum in 2003. More recently, she was awarded the Hawaii State Foundation for Culture and the Arts Individual Artist Award for Excellence in the Visual Arts. 2000 Georgetown University Law Center, Washington, D.C.